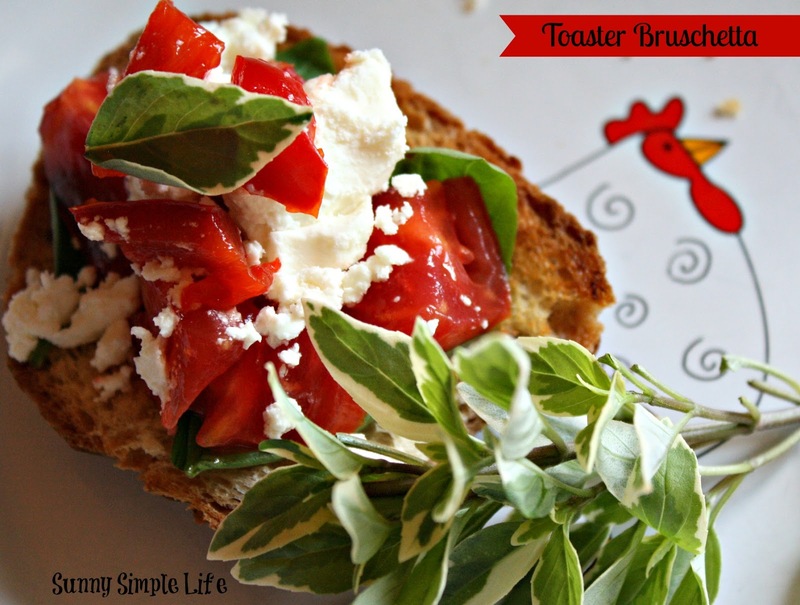 This is such an easy bruschetta recipe. Tomato basil feta bruschetta recipe. Whoooey! It has been hot here in SoCal. Coming up with dinners that don't require much cooking has been the order of the day. One night I made easy toaster bruschetta for dinner. I am telling you a big plate of this gorgeous summer treat and a cold iced tea really hits the spot. Take a good sour dough or french bread sliced and pop in the toaster until crunchy. Then lay down some slices of fresh basil like the kind I shared here. Fresh from the yard, oh the flavor. The take some diced fresh tomatoes and layer on top. Next sprinkle some crumbled feta cheese. You can always have some available cause it freezes great. Just take out a hunk and thaw and crumble. Next sprinkle a little more chopped basil on top and finish with a drizzle of olive oil right before serving. How easy is that. Great as an appetizer or like we had, a light supper when you make a nice plate full. I am making this!! Love this stuff. I've got a little basil in my garden, fresh tomatoes looking delicious, and my own feta cheese. Reminds me that I need to make feta next week because I'm down to one container in the freezer. This looks phenomenal! Thanks for the reminder. This looks amazing! Thank you for joining Foodie Friends Friday. Hope to see you next week! I just pinned this to appetizers for celebrating. YUM!